"More Than 20 Years of Diving Experience"
Dive The Big 5 was established in May 1996, as an incoming tour operator, based in South Africa, specializing in scuba diving safaris and wildlife safaris encompassing the entire coastline and length and breadth of our continent. At the southernmost parts, you will find the most beautiful places to visit in Africa. Dive The Big 5 concentrates on the scuba diving activities in South Africa which include Great White Shark cage diving, "free-diving" with Sand Tigers, Tiger, Bull and Hammerhead Sharks (The Big 5 Sharks), the annual Sardine Run, unique to South Africa, reef diving, wreck diving, and pure tropical, coral reef diving along the coast of South Africa and Mozambique, as well as "live-aboard" diving off the islands of the Bazaruto Archipelago and the Quirimba's which lie off Pemba in northern Mozambique. The "Big 5" part of Dive The Big 5 concentrates on the Wildlife Safari and touring activities of the Company. The wildlife side includes guided tours of all the major game reserves in Southern Africa, both National Parks such as The Kruger National Park, Hluhluwe/Umfolozi and the Kalahari/Gemsbok National Park and a number of Private Reserves including Londolozi, MalaMala, Sabi Sabi and others, too many to mention by name. Also included under the "Big 5" umbrella are overland safaris through Namibia, Botswana (Okavango Swamps) and Zimbabwe and Zambia to the Victoria Falls - all beautiful places to visit in Africa. The "touring" aspect of the Company includes all the major tourist destinations in Southern Africa such as Cape Town and the Cape of Good Hope and the Winelands of the Cape, the Garden Route, KwaZulu-Natal and the Zulu Culture and Zimbabwe/Zambia’s Victoria Falls with all the adventure activities associated with Vic Falls such as white water rafting down the mighty Zambezi River, elephant-back safaris in Zimbabwe/Botswana’s National Parks, bunjy jumping, canoeing etc. 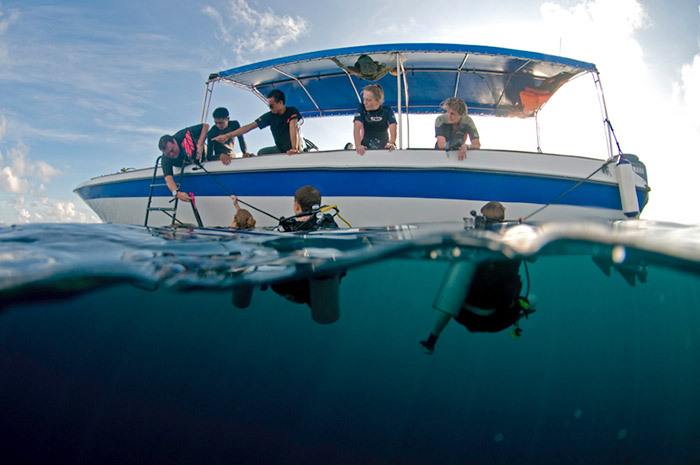 Experience scuba diving and a wildlife safari! Dive The Big 5 was the brain child of Timothy Ray, born Johannesburg, South Africa in 1948. 38 years after Jacques Cousteau was born. Tim’s business career started off with the Ford Motor Company, The Chrysler Corporation, Fiat SA, and then Volkswagen South Africa. After many years with Volkswagen, Tim decided to open a Volkswagen dealership of his own in the delightful little town of White River, in the Mpumalanga Province of South Africa, Palm Motors. Whilst working as Dealer Principal of Palm Motors, Tim became involved with Comair, who, at the time, was the only private tour operator allowed to run wildlife safaris into The Kruger National Park. 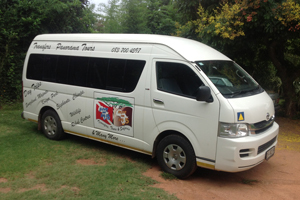 Tim supplied and serviced Comair’s fleet of VW Kombi’s which took guests around The Kruger. This is where his love of wildlife was born. Very soon Tim became a part time Guide in the Kruger National Park - a vibrant and diverse wildlife reserve, well known as one of the most popular places to visit in Africa. He registered with SATOUR, and so began a “career” as a “Game Ranger” in with Comair. Tim had to find time between being Dealer Principal of Palm Motors, husband to Audrey, and a Comair Game Ranger in Kruger. In March 1992, Tim enrolled with the Calypso Dive Club in the town of Nelspruit for a CMAS 1 Star open water certification. This is where his passion for diving was nurtured. Now he had to divide his time between being Dealer Principal, husband, Game Ranger and Scuba Diver. Not long after, in March 1993 Tim qualified as a CMAS 2 Star diver. In 1993, Tim tired of the motor industry, or was it because of a greater love for Nature, Wildlife and the Under Water World, sold Palm Motors and at the tender age of 45 embarked on a sabbatical. In May 1993 he packed up in South Africa and flew to the US and embarked on a life of a Gypsy. He bought a second hand Dodge van in Minneapolis, which he kitted out as a camper and toured the East Coast of the United States. To cut a long story short, he ended up penniless in Key Largo after experiencing some of the most breathtaking places to visit in Africa first-hand. Soon found a job, illegally, as assistant manager to Larry Murphy at the Hungry Pelican Motel at Mile Marker 99.9 in Key Largo http://www.hungrypelican.com/ . His love for diving pointed him towards Sea Dwellers Dive Centre in Key Largo, a stone’s throw from The Hungry Pelican. http://www.seadwellers.com/ His natural entrepreneurship took over and soon there was a relationship between the Hungry Pelican and Sea Dwellers. Sea Dwellers accommodated their student divers and divers at The Hungry Pelican and in turn, The Hungry Pelican directed all their diver guests to Sea Dwellers. A perfect symbiotic relationship which still exists today! Tim’s part of the deal was that he got free dives with Sea Dwellers and an introduction to hundreds if not thousands of divers. Tim soon learnt Pennekamp Coral Reef State Parks dive sites (http://pennekamppark.com) and Sodwana’s 2 Mile Reef’s dive sites (http://isimangaliso.com) like the back of his hand. He very soon became a dive master with Sea Dwellers and all his spare time was spend guiding Sea Dwellers divers on dive sites in Pennekamp, off Key Largo, like the well known Statue of Christ and the wrecks of the USCGC Duane and the USCGC Bibb. Whilst working at The Hungry Pelican his longer leave / vacation periods were spent diving all the island dive sites off the Florida Keys down to Key West, The Caymans, Bonaire, Belize, Roatan and many other islands of the Caribbean. The one thing that struck Tim every time he got back in the dive boat after a dive was that almost every diver said “my, that’s a strange accent you’ve got, are you an Aussie?” This used to piss Tim off no end. One thing you don’t do is confuse a South African with an Aussie!!!! Tim’s, reply shocked 99% of the divers he came across. “No I’m South African, why do you ask”. The reply was nearly always, “I didn’t know there was any diving in South Africa”. Why not go back home and start selling South Africa as a scuba diving destination and we can marry that to a wildlife safari? A unique combination that no other dive site in the world can offer, and hence the birth of “Dive The Big 5 in 1996”. Today Dive The Big 5 is the oldest South African based in-bound Tour Operator selling Diving Safaris to South Africa and Mozambique that we marry to a Wildlife Safari in South Africa, Zimbabwe, Zambia, Botswana and Namibia. To date we have got over 1000 divers “wet” and introduced 1000’s of Nature Lovers to Southern Africa’s natural wildlife heritage. Rely on the experts to show you the most popular places to visit in Africa.